Free Planet has written (more than) one or two blogposts about Alan Wilson and Baram Blackett's assertions that the descendants of the sixty ancient Kings of Britain kicked out the Romans (that the southern English tribes invited into Britain) and pursued them across Europe in the fourth century, at their head one King Arthur. 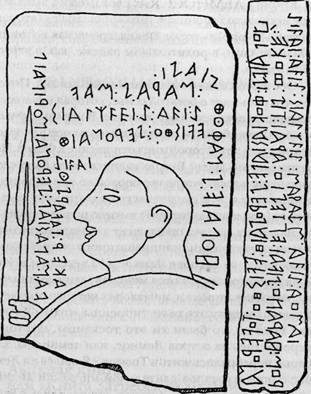 Wilson & Blackett certainly have a colourful history with a long list of petty crimes/accusations attached to their cause but they claim to be able to apply their Coelbren alphabet cypher to ancient Etruscan and Rhaetian and Syrian inscribed artefacts found in their native countries and in UK and in USA and then use an older version of modern Welsh to resolve the translations into non-nonsense English. That in itself should absolve them, no? Wilson & Blackett also make the grander-scale claim that, "The Welsh aren't (nor were they ever, mainland European i.e.) Celtic," they are Khumric - a people of the (mediterranean) sea. Did these trader-invaders speak Aramaic? Phonecian? Pelasgic? What did the Khumric language even sound like and why does Welsh have such linguistic affinity with Hebrew?